After a thorough back exfoliation to slough of dead skin cells and re-oxygenate the skin, your stresses will melt away as a warm aromatic oil is drizzled over the back and deeply massaged in. This purifying ‘facial’ for the often neglected back begins with deep cleansing followed by a skin-brightening exfoliation to slough off dead skin cells and re-oxygenate the skin . A Steam Vapazone follows and extraction of any spots, blackheads and general decongestion where necessary. A back massage follows using a purifying, balancing and calming aromatic balm containing essential oil of Ylang Ylang, to relax and release blocked energy. Following this, a deep cleansing mask is applied to the back to decongest, purify, hydrate and restore balance to the skin. The treatment is completed by the smoothing in of moisturising body milk to leave the skin clear, super-smooth and velvety to the touch. Ideal for those suffering with acne on the back and is an essential pre-wedding and holiday treatment. For optimum results or for more severe problematic backs, a course of 4 treatments, one a week, is recommended. Course discounts are available. Exfoliation is an all too often neglected step in our beauty regimes; however, it is nevertheless essential if you want your skin to look radiant and healthy. More than just a body scrub. This luxurious treatment is a great way to combine the benefits of exfoliation and pure relaxation. It uses a unique blend of fruit powders, spices, essential oils and plant oils to polish away dulling dead skin cells and boost the circulation, revealing a radiant, bright and petal soft skin. A shower follows and then a full body moisturise using aromatherapy creams. A facial exfoliation may be included for an excellent overall treat-pure bliss! Great for the Summer or before a holiday in the sun as it will help your tan last longer. 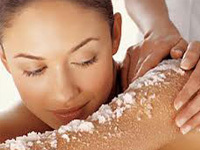 This treatment is truly one of a kind….massage and exfoliation combined in an exotic body treatment. Rediscover radiance, vitality and petal soft skin with this professional exfoliating treatment. A unique and energising blend of powdered Fruit Seeds of Orange and Apricot, mixed with Essential Oils and Spices are used to polish and perfect the skin leaving it in supreme condition. Following a shower, a delightfully relaxing massage with warm aromatherapy balms begins where your therapist focuses on any areas of tension and stress, re-energising and restoring vitality and leaving skin that is beautifully nourished and exceptionally soft all over. If time is of the essence, the Body Polisher is a 30-minute exfoliation treatment, which is ideal to have before a St Tropez spray tan or an Aromatherapy massage or if your skin needs a quick pick-me-up. Dead skin cells are sloughed away to reveal a fresh and glowing complexion and the circulation is boosted. A shower follows. A complete body exfoliation treatment using the natural particles of sugars and kiwi in order to eliminate dry, flaky skin. The skin is gently freed of dead skin, allowing it to breath. The skin’s texture is thus clear, comfortable and refined. This is followed by a shower and the application of a nourishing body moisturiser leaving the skin feeling hydrated and soft.